The bus came by to pick the residents up early, around seven, so they could make the half hour drive to the State Fair and get them down to the carnival before it got too hot. 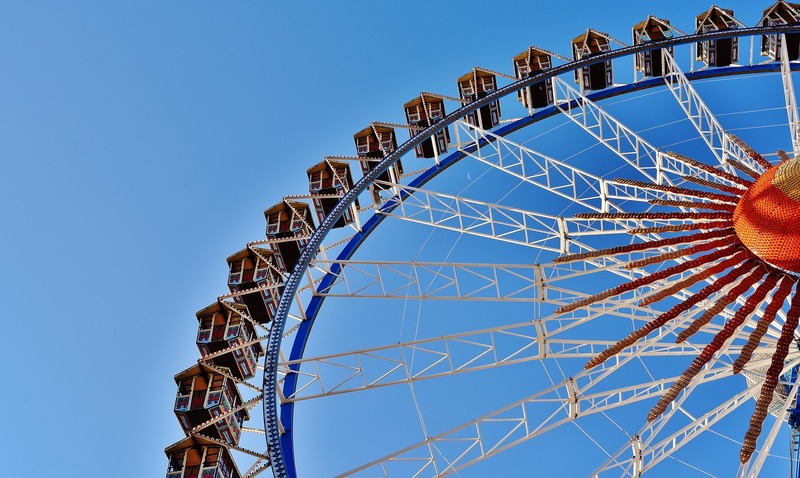 They would all want to go down to the midway, where the calliope music and the rides got them excited; they were all just children, Sue Ellen thought, and she wanted them to get their fill of it before the sun was too high in the sky. The residents had been allowed to withdraw ten dollars each from their accounts at the State Home for the Retarded; the nurses would bring a picnic lunch that they would spread out under the trees near the gate. After lunch they would walk through the Arts and Crafts building—the men liked to look at the model planes and cars and the tooled leather belts, the women liked the needlepoint and flower arrangements—and then head back. Furman was one of the oldest of the males. He had been released to a job as a dishwasher at a country club where he could live in a spare room over the kitchen, but he had wandered off twice, once ending up in a whorehouse in a converted drag strip south of town. It was decided he needed to be back at the school. Sue Ellen took one group of ten and entered the midway through the left entrance. Mary Louise took the others and started at the right entrance so that they wouldn’t block up the midway for the rest of the fairgoers. Sue Ellen was conscious of the stares as she made her way through the crowds, but her job was to watch her charges, and not worry about whether people thought she was retarded too. Still, every now and then she barked out an order: “We’re not going in that show, Nae Ann,” and she found herself wondering whether she spoke louder than was necessary in order to broadcast to the crowd that she was normal, like them. She herded her group into a tent with coin-operated games. It was cool there, the games only cost a quarter, and there were no carneys to persuade the patients to spend more than they should in the hope of winning a big stuffed animal. Lyle, a sandy-haired man of around twenty, went straight for the peep shows, the hand-cranked machines that showed an undressed woman who used curtains, fans and beach balls to conceal her breasts and groin from the viewer’s eye. “Don’t spend all your money in one place, Lyle,” Sue Ellen said. A group of women was playing skee-ball, and strings of tickets issued from the coin box at the end of the game. “I get a prize!” one screamed as she pulled the tickets out. “Why don’t you let me hold them,” Sue Ellen said as she took the tickets from the woman. “We’ll get a prize on the way out. Okay, let’s buddy up for a second,” she called out to the group scattered throughout the tent. The teenagers firing guns at screens didn’t even look up. “Who’s your buddy, everybody,” she said when the residents had assembled before her. Two by two, the men and women raised their hands to signal that they had found the person who they were assigned to as a partner. Everyone but Lyle, who remained at his peep show. Lyle made his way over to where the others were standing. “Who’s your buddy?” Sue Ellen asked. The group dispersed back to their games, with the women who had been playing skee-ball rushing into a photo booth to have their picture taken. Sue Ellen went to the entrance of the tent and spoke to the man who was selling tokens. “Did you see a tall man with a crew cut walk out of here?” she asked. “What was he wearing?” the man asked. “If I see any I’ll tell ‘em they can’t leave, how’s that?” Sue Ellen couldn’t tell whether the man was being sarcastic behind his sunglasses. She walked out of the tent and looked back towards the midway entrance, trying to see if Furman had lagged behind them. She didn’t see him, and turned her head to look up at the half-way point of the midway where the “Club Ebony” show was set up at the bend. The show had apparently begun, as there was no one, not even the barker, in front of the stage. She looked across the midway through the electric cables and trailers to see if she could see Mary Louise and her group. As she did so, she saw Furman standing talking to a man running a dart game, with big stuffed animals hanging down inside his booth. Sue Ellen scurried across the gravel to the booth where Furman was standing, his back turned towards her. The carney was talking patiently to Furman, explaining something to him, as Sue Ellen approached. “Furman,” Sue Ellen said sharply as she approached. He didn’t turn around, and when she stood next to him she saw that his face was contorted with a look of doubt and regret. “There’s plenty of fun for everyone,” the carney said into his microphone. “Win your girl a teddy bear, right here. Step right up.” The carney looked straight at Sue Ellen with dead eyes as he spoke, as if she were a lamp post. “How can you live with yourself, taking money from the feeble-minded?” Sue Ellen said. Furman was in tears, aware that he had lost his money and afraid that he would be unable to buy a snow cone. “I only have a dollar left,” he said. “I’ll take care of you,” Sue Ellen said. As they made their way back to the game tent a shrill whistle went up and a cry of “Hey Rube!” was heard over the carney’s microphone. People stopped and turned towards Sue Ellen and Furman, and watched. She turned around and looked at the carney, who glared back at her with a grim smile. Furman was crying now, embarrassed that he had lost all his money after being warned on the bus to be careful. “Can I get my money back?” he asked Sue Ellen. Mary Louise ushered her people into the tent and Sue Ellen took off towards the office trailer, which was parked behind a row of game tents. She walked up the metal steps, opened the door and saw an overweight man seated at a round table, counting money as he smoked a cigar and cradled a telephone on his shoulder. The man snapped the phone shut and finished counting a handful of bills before looking up at Sue Ellen. “Can I help you?” he asked without looking up. “I’m Sue Ellen Walton. I’m here with a group from the State Home for the Retarded,” she began. Sue Ellen stared angrily at the man, whose impassive face absorbed the force of her glare without changing expression. “So what do you want me to do?” he asked. She started to speak, but stopped for fear she’d begin to cry. “Give me five dollars,” she said finally. The man gave out a sigh and looked up again. She looked him in the eye, and the warmth that had reddened her face flowed down into her knees. “I’ll take it,” she said. The man pulled two singles off his pile of bills and laid them on the table. “I hope your day with Midland Amusements is a pleasant one,” he said mechanically. Sue Ellen looked at the bills, then at the man’s head as he resumed his counting, trying to force him to acknowledge her anger. When he didn’t respond, she picked up the bills, turned around, and walked out onto the steps. She looked down towards the game tent and saw Furman standing outside, looking back at the booth where he’d lost his money. She felt nauseous, and unclean. Con Chapman is a Boston-area writer whose work has appeared in The Atlantic, The Christian Science Monitor, The Boston Globe and various literary magazines. He is currently writing a biography of Johnny Hodges, Duke Ellington’s long-time alto sax, for Oxford University Press.